You may have heard the buzz around the EOS blockchain. Possibly, you would be looking for more information about it. And, would’ve taken a gander at other guides but didn’t seem to understand it. No worries, we have got you covered! 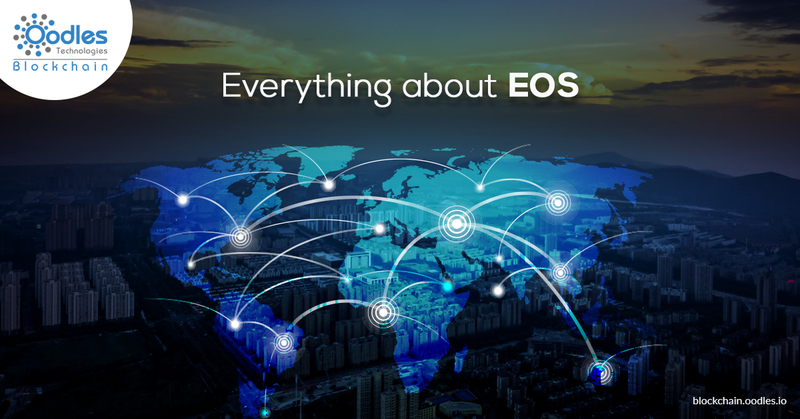 Today, I am explaining everything you wanted to know about EOS in the simplest way possible. This comprehensive guide about the latest EOS blockchain will not only help crypto enthusiasts but also be knowledgeable for beginners as well. This guide will include everything from how the project initiated to how the technology works. I will also use some real-world examples of EOS Blockchain and cryptocurrency if you’re lucky enough to reach the bottom of the guide. I expect that by the end of the reading of this guide, you would be an expert in EOS blockchain. EOS is the latest addition in blockchain projects to enter the competitive market of cryptocurrency. It aims to build a network that has the potential of processing millions of transactions per second. In fact, due to a few reasons, its ICO (initial coin offering) was quite interesting. An ICO campaign is one of the effective ways for new cryptocurrency projects to raise funds. Instead of fiat currency, an ICO raises money using a popular cryptocurrency like Ethereum or Litecoin. The primary objective of EOS is to help create a decentralized blockchain that can execute fast and feeless transactions. EOS will not only allow smart contracts to get assembled on top of it but will enable developers to release DApps as well. EOS also want to develop a platform that runs like an operating system, making it extremely easy to use. Decentralized applications can be called the future of the internet. There are now over a thousand of them available on different blockchains. An instance of a DApp that could run on EOS blockchain is a decentralized form of Facebook, where nobody has the authority to control the network and permission to access your personal information. To know more about a DApp, click here. If a tangible or intangible asset is decentralized, it means that no single person or entity can gain control over it. Another goal of EOS is to be able to execute millions of transactions within seconds. It might fix a big problem. Although other blockchains can recognize and execute smart contracts, none of them can process them with speed. For instance, even though Ethereum is one of the most popular Smart Contract blockchains, it is only able to handle 15 transactions per second. Approx. 52,000 Facebook likes happen every second and every single like can be known as a separate transaction that you don’t ever see. Then comes the finance sector that requires to process more than 100,000 transactions per second. Here, you can see the need for millions of transactions per second, making EOS a perfect alternative for these types of industries. Another solution that EOS is trying to find is the issue of usability. For instance, both BitShares and Steem can execute around 100,000 transactions per second and utilize smart contract technology. However, it’s quite challenging for developers to incorporate basics such as task scheduling and account recovery. By utilizing an operating system protocol, EOS will allow developers to insert these core functions. So, now we know what the EOS team is trying to attain, the next part highlights how the technology works. 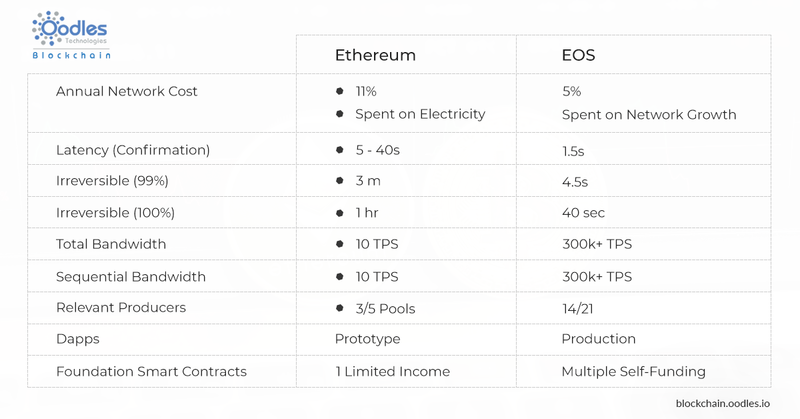 How does the EOS work? EOS, like many other smart contract blockchains, is being referred to as the ‘Ethereum Killer.’ It means that it can do whatever that Ethereum can but in a more enhanced and improved way. So, the comparison of these two may make it easy to understand its work. As we know, both EOS and Ethereum are capable of hosting decentralized applications, which get supported by smart contracts. However, the significant distinction lies in the amount that each network can process at any given time. It can be known as ‘Scalability’ which is one most vital things to consider while assessing the potential of a blockchain. Ethereum still processes about 15 transactions every second, which can be the main obstacle that hinders its global adoption. However, it’s hasn’t been completely developed yet, but the EOS team is working on to increase this number to over a million. Why EOS is a ‘Ethereum Killer’? The reason Ethereum fails to process a myriad of transactions is the way it handles data- each block stores only limited information. For instance, think of an empty shipping container that has the capacity of two thousand boxes. And, because of the container’s size, it won’t be able to fit more boxes. In Ethereum, not only each block carries 15 transactions, it takes a lot of time for it to reach its destination. The technology that bolsters this data process is known as Proof-of-work (PoW). They are known to be sluggish, costly and unsuitable for the environment. Proof-of-Work (PoW) is a sort of consensus model. There are better alternatives available in the market, such as Proof-of-Stake and Delegated-Proof-of-Stake. The team of Ethereum is trying various things to fix this issue-such as off-chain transactions or sharding. But, they haven’t implemented a solution yet. As mentioned, instead of using PoW like Ethereum, the EOS blockchain will be using a new consensus model called Delegated-Proof-of-Stake (DPoS) and may succeed in solving the problems that Ethereum tries to fix. As we know blockchain is decentralized, EOS investors, not a central authority, will vote for who they think should become a witness. But, the potential of your vote will depend on how many EOS you have, which is called ‘stake.’ The more coins are on stake, the more power your vote will have. The work of two hundred witnesses is to secure the network and get paid for completing the task. Also, lots of backup witnesses wait for their turn to secure the blockchain so that they can get paid as well. If a witness fails to fulfill this task, he can be voted out off the network. It will provide the backup witnesses a chance to take the job. It will help lay the foundation for a more effective system, allowing fast, cheap and environmentally efficient transactions. Ethereum, however, requires every node (individual computer) connected to the network to reach an agreement before confirming a transaction. Thus, a transaction on Ethereum takes a while to reach its destination. A node (or computer) provides support for running a blockchain network. By giving up the computing power and connecting to a network, anyone can become a node. Another advantage that EOS blockchain brings is that it will be possible to freeze transactions with it. But, why is it so important? It’s because you surely would have heard of the famous DAO hack. Somebody stole $50 million worth of Ethereum coins in the year 2016. If the Ethereuem blockchain had the DPos consensus model backing up its transactions, the attack could have prevented. Like any other blockchain, EOS also has its native cryptocurrency, called EOS. When using the Ethereum blockchain, you need to pay some amount as transaction fees. It’s called GAS, and as more and more people use the network, it gets more and more expensive. This concept is the reason Ethereum becomes unusable on a global level as it won’t be worthy to make small transactions. When people need to use the network, they will have to rent EVM (Ethereum’s Virtual Machine), which requires a transaction fee. The EOS is a bit different though. Instead of ‘renting’ computing power, it’s coin holders get the ownership of the network. In simple words, if you own 15% stake in EOS coins, you would own 1% of the network. It means you would have 1% of the required computing power to execute the transaction. Thus, transactions on EOS are fee-less. The EOS coin works the same way as any other cryptocurrency- you send, hold and receive funds between crypto wallets. It makes it an effective payment system as you can make transfers to anyone around the globe for free, within a few seconds. So, now I end this comprehensive guide to thoroughly knowing “what is EOS?” If you had the patience to read this from the beginning to the end, you would have gotten a great understanding of what EOS tries to achieve, why the project initiated, how the technology works and why the EOS cryptocurrency is valuable. Indeed, we can say that it has the potential to become one of the most used blockchains in the future, with fast, free and scalable transactions. Probably, EOS could be the real Ethereum killer. Do you think it can reach its target of millions of transactions per second? So, drop your views in the comment section and let us know what you think. Oodles‘ Blockchain is a step towards leveraging the potential of Blockchain and help transform this complex world. In case if this blog has failed you to tell things about EOS blockchain you wanted to know about, contact us for a free-of-cost consultation and find us at your disposal. In EOS not 200, but just 21 Block Producers. If you own 1% EOS tokens you can use up to 1% of the network. Hello, I want ask on using EOS for new cryptocurrencies. I am doing McSaki Tennis Platform where will be Coins and tokens for completed TennisLife include new TennisCoin. Peoples will be earn and mine these coins and tokens their activities… I am looking,now for Technologies, Software, Experts… Thanks, Mr.Dusan Sadecky,Mgr.